The trapped ion quantum technologies group at Fysikum led by Markus Hennrich has published a paper in Physical Review X reporting the first Rydberg excitation of trapped strontium ions. Trapped Rydberg ions are a novel quantum system and a promising candidate for building a scalable quantum computer. Gerard Higgins, PhD student on the ion trap experiment, is smiling proudly. “We have been setting up this experiment for a while, and now it is working like a charm!” Gerard is referring to the novel experiment on trapped Rydberg ions at Fysikum. Gerard and his colleagues have just recently published their first experimental results in the prestigious journal Physical Review X. They are one of only two groups in the world who have realized trapped Rydberg ions. 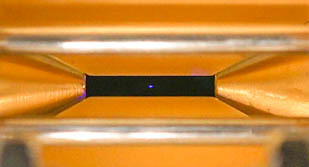 Trapped strontium ions (blue) in the centre of a Paul trap. 8 laser-cooled strontium ions in a zigzag-shaped crystal. Just recently, the European Union has announced support for quantum technologies within a 1 billion euro flagship programme starting in 2018. 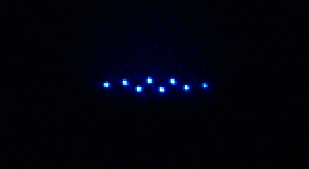 Trapped Rydberg ions are a new quantum system that combines two leading quantum technologies – trapped ions and Rydberg atoms. From trapped ions they inherit the precise manipulation, storage and detection of qubits, while their Rydberg character gives them strong and long-range entangling interactions. This combination makes trapped Rydberg ions a promising system for realizing the next generation of quantum computers. Markus Hennrich and his colleagues are the first group worldwide to generate trapped Rydberg ions with strontium. Instead of one laser with high photon energy for Rydberg excitation, they use two lasers with half the photon energy. This has the advantage that the ions remain stable in the trap and allows them to be controlled with much higher precision. With this technology the team investigated the fundamental interaction of an ion with the electric fields of the trap. In particular they show that symmetric Rydberg S-states are much less affected by the electric fields and are therefore more suitable for future applications. This experiment demonstrates an unparalleled level of control over trapped Rydberg ions and reveals fundamental physical properties of this novel quantum platform. In particular it shows the system can be controlled to the precision required for future applications in quantum information processing. For more information see: Higgins et al., Physical Review X, 7, 021038(2017). Previous PostEmely Lindblom – mottagare av RRS Jack Fowler award 2017Next PostVi minns Kjell Fransson med tacksamhet!